Dr. Anthony J. Geroulis welcomed Dr. Charles Galanis to his practice, North Shore Center for Facial Plastic & Cosmetic Surgery, in November 2015. Dr. Galanis will focus on cosmetic surgery of the breast and body, along with reconstructive surgery for breast and skin cancer. Board-certified plastic surgeon Dr. Charles Galanis joined Dr. Anthony J. Geroulis at his Northfield-based practice, North Shore Center For Facial Plastic & Cosmetic Surgery. residency in general surgery at The Johns Hopkins Hospital. His breadth of experience includes a grant by the N.I.H., which allowed him to perform two years of research at the Memorial Sloan Kettering Cancer Center. He went on to graduate from UCLA’s highly competitive plastic and reconstructive surgery program, which is regarded as one of the finest plastic surgery training platforms in the country. Dr. Galanis rounded out his experience in Los Angeles with a year as Microsurgery Fellow and Clinical Instructor at UCLA. An author of over 20 peer-reviewed articles and book chapters, Dr. Galanis is well respected in his field. At North Shore Center for Facial Plastic & Cosmetic Surgery, his main areas of focus are aesthetic surgery of the breast and body, along with reconstructive surgery for breast and skin cancer. For more information about North Shore Center for Facial Plastic & Cosmetic Surgery, please call (847) 441-4441 or visit http://www.geroulis.com and http://www.galanisplasticsurgery.com. 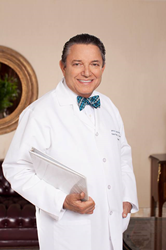 Bringing over 33 years of surgical and artistic experience to the field of facial plastic & cosmetic surgery, Anthony J. Geroulis, MD, FICS, has repeatedly been named a “Top Doctor” by U.S. News & World Report. Board certified in cosmetic surgery, author and active sculptor, Dr. Anthony Geroulis is a clinical professor of surgery at University of Chicago Medicine. His medical office is headquartered in Northfield, with offices in Chicago, at University of Chicago Medicine and at St. Alexius Medical Center in Hoffman Estates.